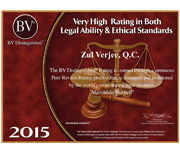 Contact Verjee & Associates for its extensive legal experience. Who are Verjee & Associates? Verjee & Associates is a specialty law firm dedicated to providing clients with the highest standards of service and expertise. Through our relentless focus on client success, Verjee & Associates delivers integrated legal solutions to complex business issues. 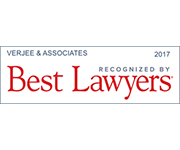 Verjee & Associates’ lawyers are widely respected for the depth of their industry knowledge and for being responsive, efficient and easy to work with. We have the flexibility and skills of a boutique firm that delivers the results of a large firm. We remain firmly at the forefront of the legal profession as a result of our solid individual professional backgrounds and our collective creative energy and efforts. While active in the legal community and frequently called upon to provide their legal expertise in an array of complex matters, Verjee & Associates’ lawyers have practical and thorough knowledge of litigation, mediation and arbitration strategies, tactics and procedures. 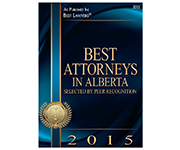 Our work has resulted in several reported decisions from the Court of Queen’s Bench of Alberta as well as the Alberta Court of Appeal and we have significant experience in private arbitrations and mediations. The disputes in which we act are as diverse as the clients whom we represent. From shareholder disputes, loan enforcement, breach of contract and bankruptcy litigation to libel and slander, professional negligence, oil and gas disputes, partnership disputes and Insurance Litigation, we bring extensive industry knowledge and finely honed advocacy skills to each file. 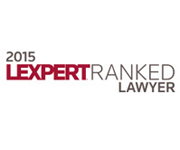 Our lawyers are rigorous yet imaginative when it comes to obtaining results. We would consider it our privilege to achieve those results for you. Verjee & Associates is a specialty law firm dedicated to providing clients with the highest standards of service and expertise. Through our relentless focus on client success, Verjee & Associates delivers integrated legal solutions to complex business issues. Please join us for a message from our Founder. 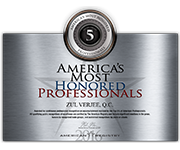 Verjee & Associates’ lawyers are widely respected for the depth of their industry knowledge and for being responsible, efficient and easy to work with. We have the flexibility and skills of a boutique firm that delivers the results of a large firm. To meet our dynamic team, please view here. 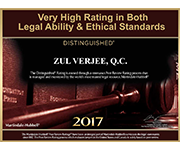 At Verjee & Associates, we seek enthusiastic, intelligent, motivated legal professionals who will further our reputation as one of the very best providers of legal services. 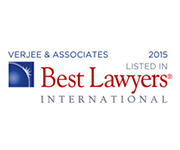 Please forward your resume to: info@verjee-law.com if you would like further information.